Around the world billions of people watched the Olympic Games last month. In this article I am going to explore the technology that is used in order to get the live action, be it aquatics, basket ball or shooting, from the event, onto our TV screens. Live TV is a little different to recorded television. With recorded television, it has often been carefully chopped up and edited before it hits our screens. With live TV, the luxury of being able to remove mistakes isn’t there, as too much a delay would mean events were actually not live. There are a few seconds of delay between real events and what you see on your TV screen, like their is with radio, however this isn’t enough time for any extensive editing. So imagine we are watching the men’s Olympic 100 metres final. Usain Bolt lines up along with two other Jamaicans, three Americans, a Trinidadian man and a Dutch man. The starters pistol blows and then what? Well there is a lot more video broadcast equipment involved than you might think! The first part of the chain is the cameras. These capture all the events first hand. At an event like the Olympics, there will usually be tens, and sometimes hundreds of cameras, and a good broadcaster will always try to keep them out of shot of each other – so you don’t get a camera panning to a shot which features another camera in it! 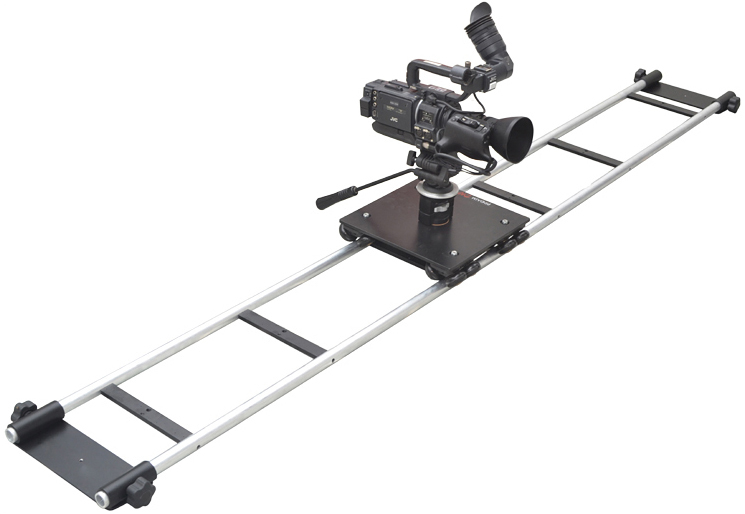 The camera may be free standing, or it could be on a dolly or a jib. A camera dolly is effectively a track that the camera sits on, so that it is able to move smoothly to capture moving action. A jib is a device which has a camera on one end and a counterweight on the other. A jib allows a camera to be moved freely around an area. When you see a swooping style shot on television, that will usually have been achieved by a jib. The camera will have various different wires coming out of it which will ultimately lead to a monitor. Behind the monitor will be a director who decides how and where the camera is to move to get the best shot. The camera will then link into a mixing desk, which in a live event like the Olympics will usually be in a really big, extremely technical looking van. Inside the van will have a number of operators choosing which of the hundreds of buttons to press, and which shot should be used – don’t forget there will be loads! This van will control the stream of visual and audio footage that is send to TV sets across the area, country and possible the world. Sometimes the format of the stream may have to be changed. To do this a digital media streamer is usually used. To see an example of what a digital media streamer looks like, have a look at the Sencore website – under the Signal Sources tab. Once the finalised stream is ready, a great big satellite dish on top of the van (the one with the mixing equipment inside) will transmit the stream to a satellite high up above the earth. The satellite then sends the signal to all the local masts where the stream will be broadcast from. These masts are usually called television masts and are often really tall thin metal structures with a flashing red light on top – to warn passing aircraft. The television masts are transmitting the signal far and wide, and your areal on your roof will pick up this signal. It will then pass down the wires in your house and after an exchange box reach your TV, where thanks to either LEDs, plasma, or some other means, you will see Bolt steam to victory! If you have a satellite dish the process is slightly different as you receive the feed directly from the satellite. Also if you have a portable aerial, you bypass all the wires in your house. So, that is how a live event reaches your TV screen, and it does all of that in less that 30 seconds. Pretty amazing don’t you think? Really informative, I’m sure lot of people including me would be unaware about the technology used in Live Television. Such info actually makes you proud that you’re a human and did so amazing inventions with limited resources.